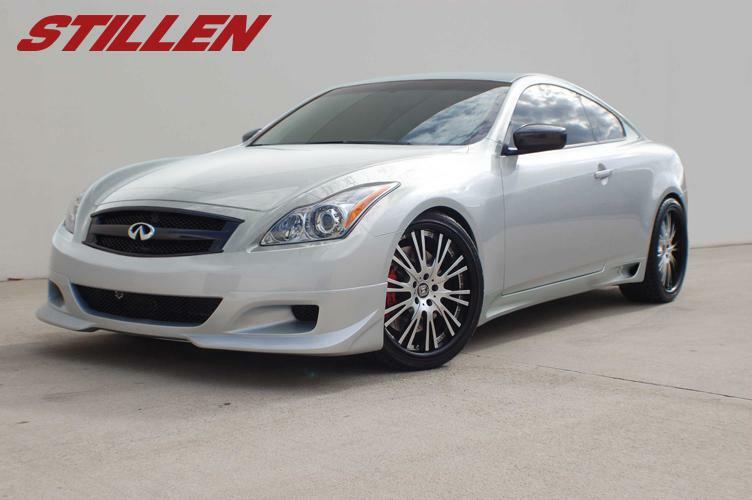 STILLEN G37 Body Kits & Aero Components INFINITI - Dezod Motorsports Inc - Home of the automotive performance enthusiast since 2002. The Infiniti G37 Coupe continues to collect awards and capture the attention of the media and car enthusiasts alike. STILLEN further improves the appearance with our urethane body kit. Designed and crafted at STILLEN’s in-house studio. The urethane lip spoiler, side skirts and rear valance add a distinctive, customized edge to the already striking G37 Coupe. When modified with these simple to install pieces the G37 takes on a more purposeful, agressive appearance. The look, fit, feel, and finish are factory quality, thanks to STILLEN’s rigid production standards and the direct molding process used to create all of our urethane components. STILLEN has been creating urethane products in this fashion for over 20 years, and these G37 parts are no exception. As with all urethane components, the G37 parts come with a limited lifetime warranty against cracking or breaking under normal use. To complete the look, combine these parts with the STILLEN grille, roof wing and rear spoiler.